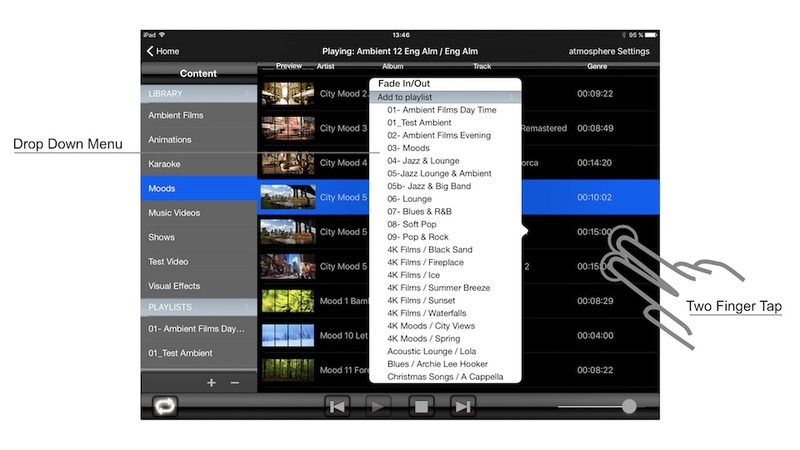 The atmosphere iOS Controller App has been developed to help you control one or more atmosphere media player© from a single iPad. 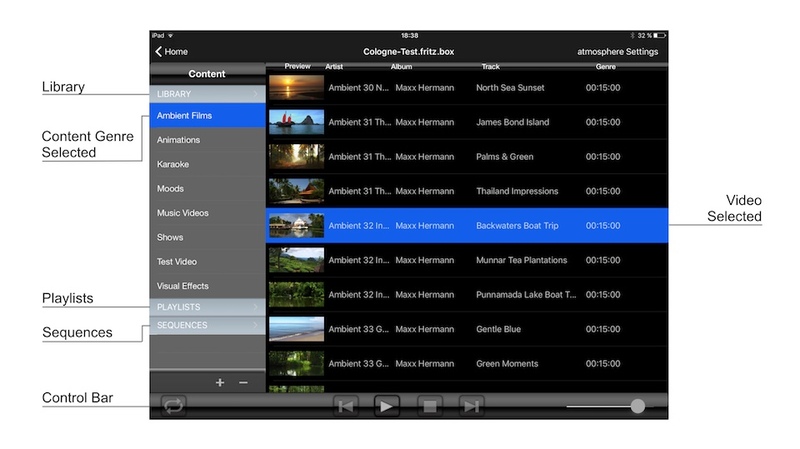 You can use this application to remotely control an atmosphere media player© running on a Apple MacPro 6-Core computer (Multiscreen) or an atmosphere media player© running on a Mac Mini i7 computer (UHD single screen solution). Ensure that the iPad and the Mac are on the same network. Ensure that the ports used by Bonjour are not blocked by your router. Got to the App Store and download the “atmosphere Controller” app. It’s free of charge. Make sure that your iPad has the iOS 9 operating system. Both iPad and Mac computer must be connected to the same Wi-Fi Network. The atmosphere media player© must be running on the Mac. 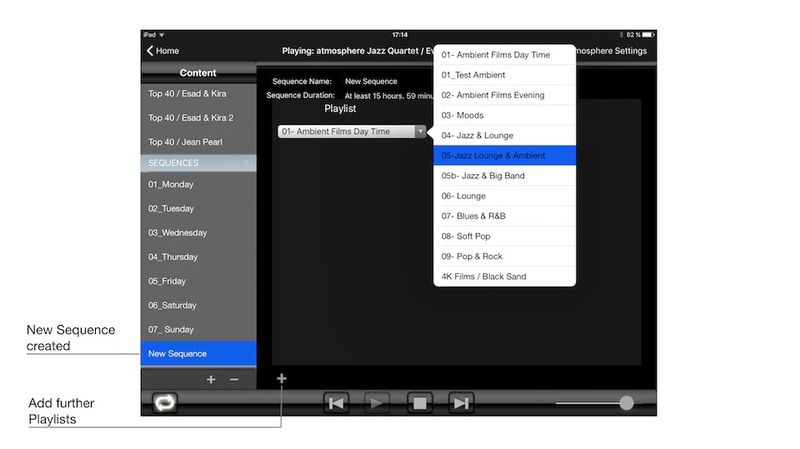 Launch the atmosphere Controller on your iPad. The Controller will find the atmosphere player automatically. The atmosphere Controller will show the current atmosphere player status running on your Mac. 3. The atmosphere Control Screen. 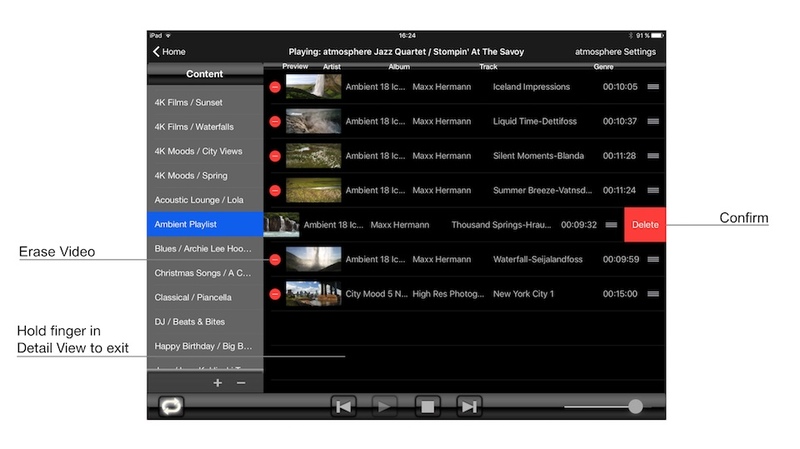 The atmosphere Control Screen on the iPad is very similar to the atmosphere media player© on your Mac. 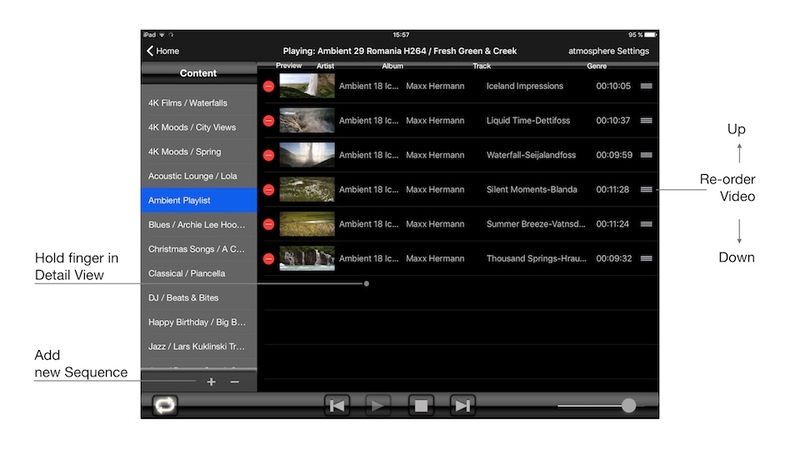 This screen allows you to play single videos as well as play, create and edit Playlists and Sequences. On the left side under Content you can select between Library, Playlists or Sequences. You can expend and collapse each of them by tapping on it. Drag to scroll up and down. When selecting a single video, Playlist or Sequence, the selected item turns blue. This presents a view of the atmosphere Content on the Mac. When an item on the left is selected, the content of that item is displayed in the detail view on the right. Tracks from the library get added to Playlists. This presents a view of the Playlists in the system. A Playlist is a list of videos from the Library which play in the order in which they are presented. Just as with the Library, a selected item has its videos displayed on the right. Playlists get added to Sequences. This presents a management interface to the Sequences in the system. A Sequence is a list of Playlist which play at an assigned time of the day. Using this interface you create your Sequences. 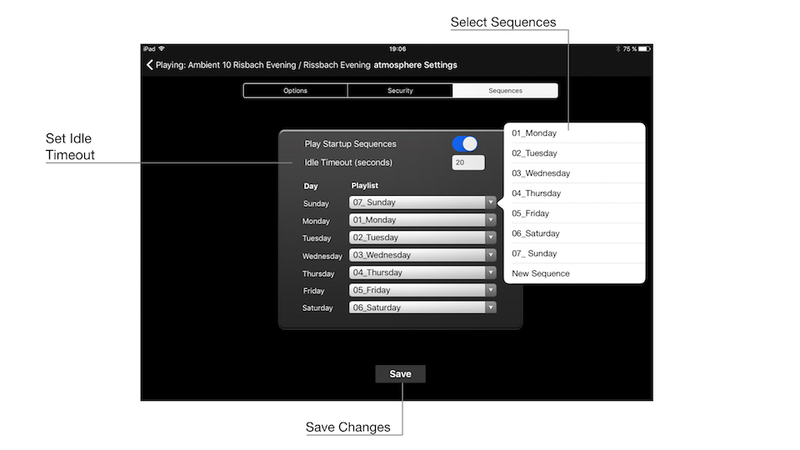 Scheduling a Sequence to run on a particular day of the week is done under Settings. ** The atmosphere Volume Control is independent from the Mac main volume. The Mac volume should be set to 100%. The atmosphere media player© does an automatic fade in and out when playing and stopping a video. It is possible to deselect this feature if a video has to be played without fade. Select a video and with a Two Finger Tap open the drop down menu. You can now select or deselect the Fade In/Out feature. Note: All atmosphere content videos are edited with a fade in and fade out, this function will only work with external videos that are not produced with a fade. Tap in the Playlist area and then select “+” to add a playlist (or “-“to erase it). Write a new name in the pop-up window. 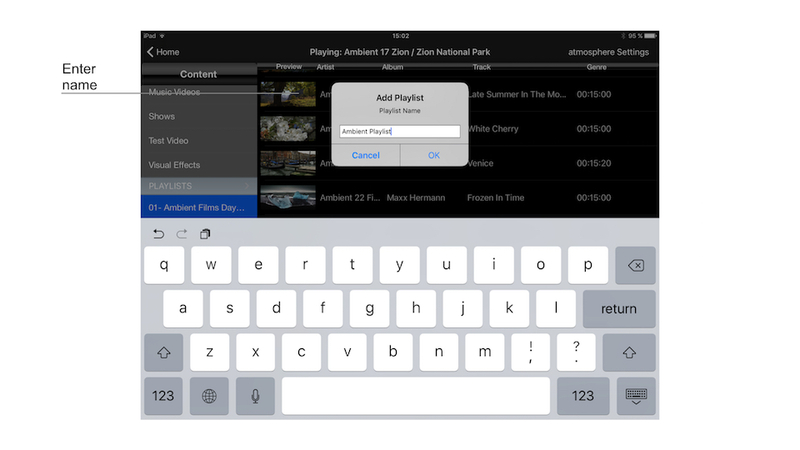 Select one or multiple videos from the Content library and with a Two Finger Tap open the Playlist pop-up menu. Scroll to the new Playlist and add your selected videos to it. Hold your finger in the detail view of a playlist for more than 1 second to enter the edit mode. You can re-order videos by holding the “hamburger” sign and quickly move the video up or down. You can erase any video in a Playlist by tapping first on the red “–” sign left and then clicking “delete” on the right to confirm. Hold your finger in the detail view of a playlist for more than 1 second to exit the edit mode. 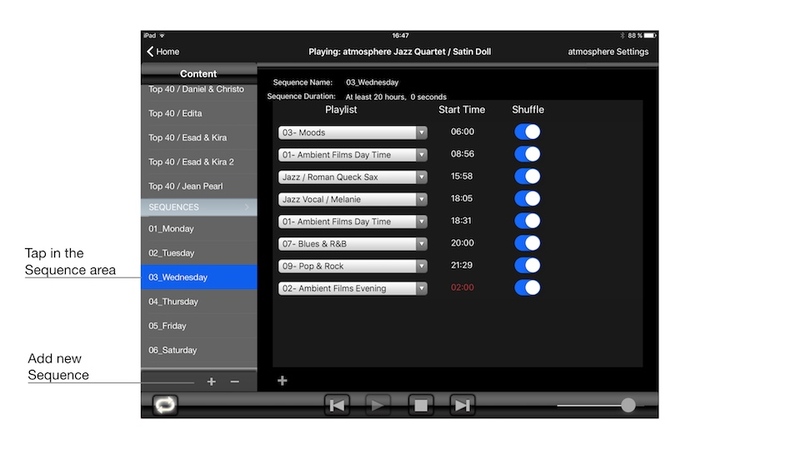 The atmosphere Controller App allows you to create and schedule Sequences for the automatic play of Playlists throughout the day. You can create as many Sequences as you wish, typical usage is to create seven, one for each day of the week. Enter the name of the new Sequence in the text dialog. 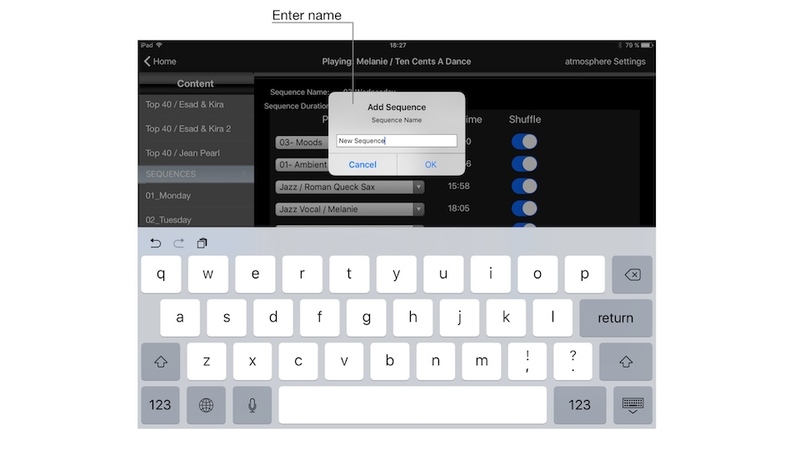 Tap on the + icon in the Sequence detail view to add a Playlist to the Sequence. This will add a new Playlist entry to start at the end time of the previous playlist. Tap on the Playlist drop down to select the Playlist you wish to use. Select the Start Time of the Playlist. The Settings window has 3 sections: Options, Security and Sequences. Note: Changes must be explicitly saved to register changes in the atmosphere media player©. Content Location: the path to your content folder can be changed. Write the new path and save. Note: If your system has been set up by an atmosphere technician don’t change the settings. The Security window allows you to change the original Password if you want to. Enter the new password and save. You can enable automatic sequences for a whole week. is the minimum timeout that can be set. The atmosphere media player© remembers the device that is connected to it. When you attempt to control the atmosphere media player© and it is currently being controlled by another device, control can be forced by authenticating. For actions that control playback, there is a delay of about 4 seconds before interaction is enabled again. When Sequence playback is enabled, the sequence for the current day begins playing as soon as the atmosphere media player© is launched. When a sequence plays it always plays the Playlist for the current time. If the current time comes before the start time for the first playlist then the last playlist from the previous day is looped until the start time occurs and the day’s sequence begins. 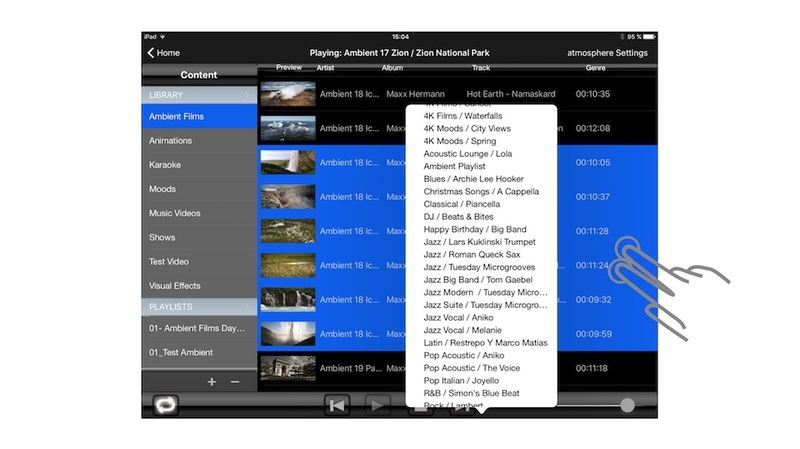 This feature supports 24/7 use of the atmosphere media player©. When a playlist start time comes before the natural end of the previous Playlist, then that Playlist would be interrupted for the new Playlist to start. When a Playlist start time comes after the natural end of the previous Playlist, then that Playlist is looped until the new start time is reached. When moving to the next video in a Playlist and the next Playlist is schedule to start within 30 seconds, instead of playing the video, the system moves directly to the next Playlist. This means that there is a 30 second variance in the starting of a Playlist. This is especially true is shuffle is selected.